Dust off your mashie, buff your niblick, and iron your plus-fours! Join the Baltimore Architecture Foundation at the Elkridge Club for a classic golf outing, car show and good time in support of The Baltimore Architecture Foundation. Golf attire required for golfers: Collared shirts, no steel spikes. Car Show & Cocktail Reception included with golf ticket. You don’t need to be a golfer to enjoy this festive summer outing at the Elkridge Club. 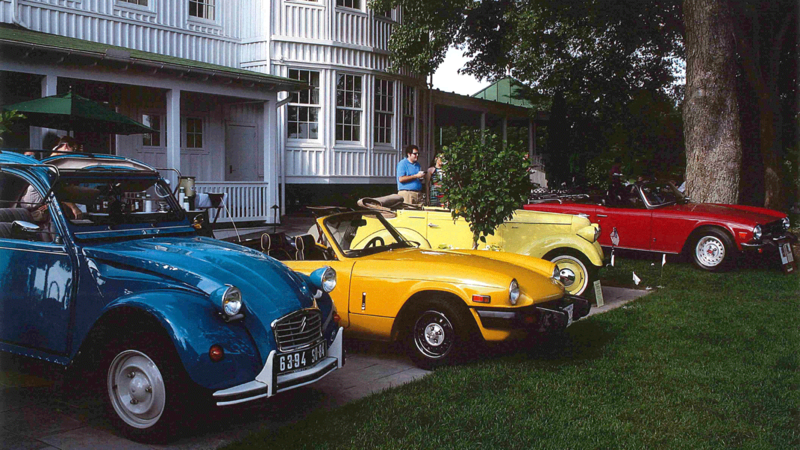 Arrive at 5:00 pm for the classic car show, displaying one-of-a-kind treasures dating from the Jazz Age to present day, while enjoying an early summer evening on the Club’s wide porch and greens. Savor Caribbean-themed roast and cocktails from the open bar, featuring the Elkridge Club’s famous Southsides. Proceeds of the event will be donated to the Baltimore Architecture Foundation (BAF): a non-profit, educational organization that promotes public understanding and appreciation for Baltimore’s architecture and built environment. BAF programs include Doors Open Baltimore, architectural tours, lectures, exhibitions, awards and public outreach and education programs. BAF is also engaged in research of early architectural firms and practitioners of architecture in Baltimore, and publications on Baltimore architecture. Consider sponsoring the golf outing! See sponsorship opportunities. The Baltimore Architecture Foundation is a 501(c)(3) education organization. Sponsorship is tax deductible to the extent allowed by law. Sponsorship does not include player registration.